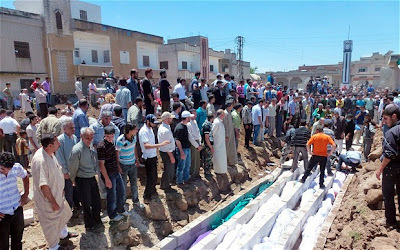 What happened Friday in Houla - a collection of farming villages in Syria's Homs province - was one of the deadliest single events in a 15-month old uprising against Assad has killed thousands. A U.N. report Tuesday said 49 children and 34 women were among the 108 people who died but the report did not say who carried out most of the killings. The killings have emerged as a potential turning point in Syria's conflict, prompting the strongest condemnation from Russia, a strong ally. International envoy Kofi Annan has met with the Syrian president, trying to salvage a cease fire that was supposed to begin April 12 but has never really taken hold. If you Google "Houla Massacre," you will see videos and photos of dismembered bodies lying in homes and streets, rows of bodies being prepared for a mass grave burial, and children with gaping wounds. It's a really sad thing. The president's regime has denied playing a role in the massacre, yet this militia is claiming to represent the Syrian government. Syrian's unrest began in March 2011, with protests calling for political change. Government troops swiftly cracked down at the uprising and many in the opposition have taken up arms to defend their towns and attack government troops.